For 1980, the Signature Series was available in both coupe and sedan formats. This edition was a successor to the 1979 Collector's Series option package and included most Lincoln options. These cars were available in either burgundy or silver exterior colors. The only interior color was red, in either leather or velour. Unique features included a rechargeable glove box flashlight, special seat sew pattern, gold and Macaser Ebony wood treatments and a complete digital instrument cluster with fully electronically controlled EEC III engine with a 4-speed AOD, and a leather-bound tool kit in the trunk. When first introduced in September 1979, final cost could exceed $24,000 USD which converts to approximately $79,197 in today's dollars. In 1981, the Signature Series edition was offered again in red or silver, with a choice of black or white exterior colors being added near the end of the model year. The interior color on these Signature Series cars was red only, in leather or velour. For 1982 and 1983, the Signature Series carried on but lost its exclusive colors as these cars were now available in any exterior color and any interior color. The tool kit and glove box flashlight were no longer featured as well. Marco_Ghostly Uploaded by Marco_Ghostly on Aug 11, 2017 . 1982 Lincoln Continental Mark VI Signature Series - Desktop Nexus Cars Download free wallpapers and background images: 1982 Lincoln Continental Mark VI Signature Series. Desktop Nexus Cars background ID 2291723. For 1980, the Signature Series was available in both coupe and sedan formats. 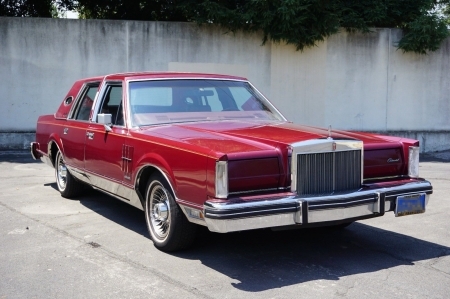 This edition was a successor to the 1979 Collector's Series option package and included most Lincoln options. These cars were available in either burgundy or silver exterior colors. The only interior color was red, in either leather or velour. Unique features included a rechargeable glove box flashlight, special seat sew pattern, gold and Macaser Ebony wood treatments and a complete digital instrument cluster with fully electronically controlled EEC III engine with a 4-speed AOD, and a leather-bound tool kit in the trunk. When first introduced in September 1979, final cost could exceed $24,000 USD which converts to approximately $79,197 in today's dollars.